A better way to throw snow? 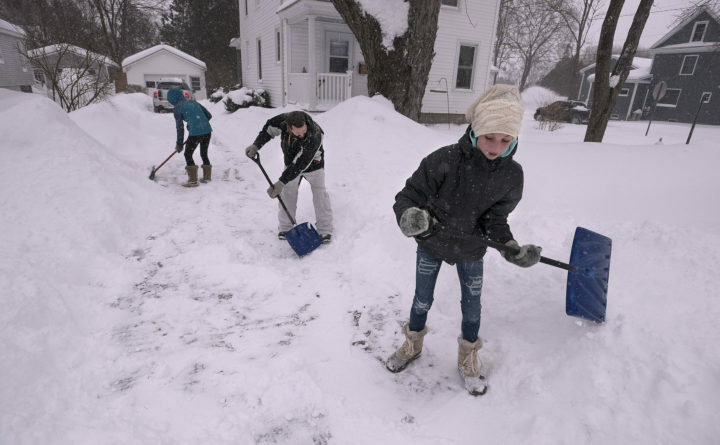 Claire Sellnow, right, Lee Rowe, center, and Anna Sellnow shovel snow from the driveway of their Bangor home, Dec. 25, 2017. Let me preface this. I find clearing the driveway (and also mowing the yard) to be kind of therapeutic. For me, there is something strangely satisfying to see a driveway filled with varying amounts of snow transform into a crisp, cleaned-out dooryard with perfectly formed lines marking the snowbanks. OK, maybe mowing is a bit more fun since I have a riding mower and can sort of pretend that I am racing in the Daytona 500 as I make what seems to be an infinite number of loops around the back yard. Plus, you know, it’s warm and there is no blowing snow flying back in your face while you clip the grass. There is nothing more beautiful than a fresh layer of snow blanketing the yard and trees plus it covers up all of the brown, slushy goop that falls off vehicles. However, every year, I seem to struggle to find just the right pattern with the snow blower so that I am not throwing snow into a path I have already cleared, or creating a mountain at the end of the driveway so that it’s impossible to see oncoming traffic. I also find it incredibly frustrating to shift the snowblower into reverse as backing up with only two speeds to choose from takes far more time than using the six gears of forward propulsion to chew through endless piles of powder. For nine years, I have tried to find just the right pattern to maximize efficiency and minimize time, but to no avail. Naturally, my swaths vary from storm to storm, based on which direction the wind is blowing. To combat the wind-in-the-face dilemma I have tried a number of different options. My wife purchased some nifty ski goggles that I thought were the perfect solution, but I quickly learned that they tend to fog up after a few minutes, making it impossible to see anything. She then got me a full-face ski mask, naturally in the design of Spider-Man because, well it’s Spider-Man. That too posed challenges, as the eyeholes didn’t quite line up to my face, creating a frustrating, and probably quite funny, scene of me constantly pulling at the mask trying to see which way I was walking as the snow swirled all around. Despite all of these struggles, once finished I often find myself marveling at the transformation of our long driveway and occasionally brag about my accomplishments. Yes, I am probably just fishing for compliments, but those are few and far between. My sense of pride, however, almost always turns to dread. Every time it seems, as soon as I get out all of my snow gear and sit down to enjoy some hot cocoa, I hear the distant sound of the plow truck rumbling down the street getting ready to dump a whole new pile into the mouth of the dooryard.